The Manse Clinic has been performing freckle removal laser, and sun damage removal laser on the face and body for many years. Our clinic sees the difficult and resistant cases of freckle removal. This page is about freckle removal on the body, for information on freckle removal on the face see this page. Patient is to arrive with no makeup and no history of use of self tan/ spray tan for at least 4 weeks over whole body. Doctor will recommend test patching prior to freckle removal laser treatment. If the patient is Fitzpatrick 1-2 (fair skinned) then they can go ahead with the test patch on the day. If they are darker skin toned or at risk for PIH (Post inflammatory Pigmentation) then they will be advised to use topical lightening agents for 8 weeks prior to treatment. These topical agents are sold at our clinic. There is opportunity to ask the doctor questions about the procedure. The patient will lie on the examination couch with protective goggles over their eyes. Gel may be used on the skin of the as the laser is used. 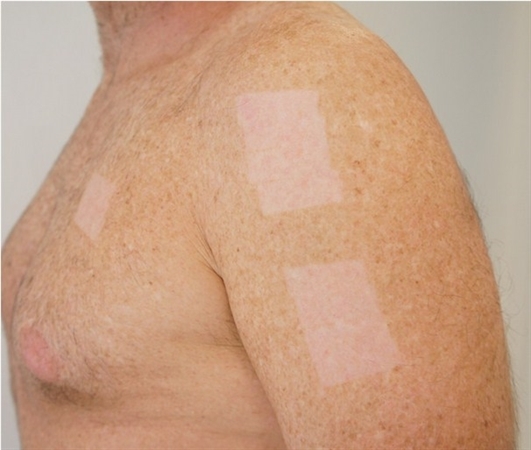 With full body freckle removal laser, the test patches will be performed typically in small areas on the lower legs, thighs, abdo, back forearms, upper arms chest, neck, upper and lower back and face if required. 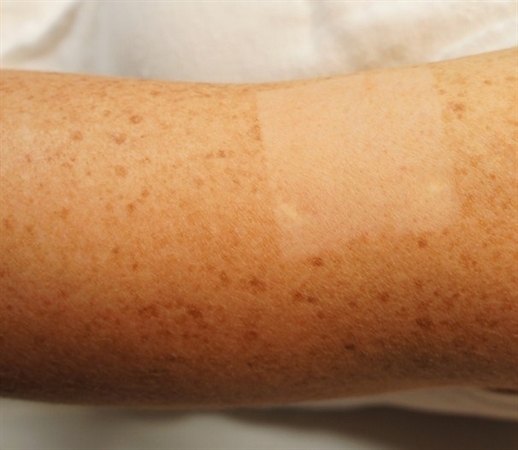 Immediately after treatment, the skin in the test patched area may be red and feel a little sun-burnt. 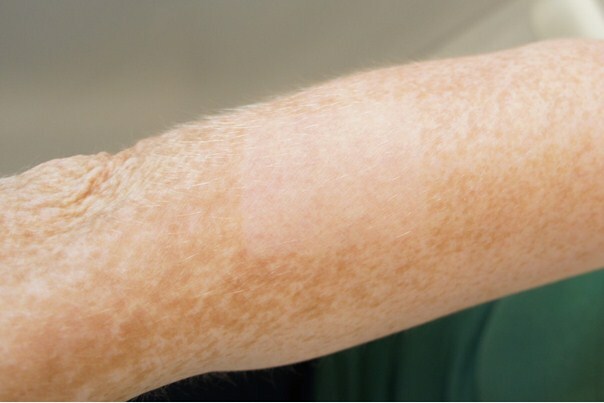 A sunburn-like feeling is common after freckle removal laser treatment. This is normal. Sunscreen or makeup may be applied immediately after the treatment to the treated area. The patient may purchase a soothing gel for post laser care. Use the soothing gel regularly on the area. Keep the area out of the sun. Avoid acid or anti-aging skin products on the area for 3-6 weeks depending on area treated. Day 1 there may be redness in the test patch area and darkening of the freckles. Over the next few days the redness will reduce and the freckles may darken. The perfect freckle removal test patch result. Your test patch results will be reviewed with the therapist. If it fits in with the patient’s life, the full treatment can be performed on this day. As the photos, consent and history taking have all been done already then the full treatment can go ahead straight away. The appointment is 30 minutes. The patient will lay on the treatment bed. Goggles will be worn by the patient to protect the eyes. Clear ultrasound gel may be applied to the area. One pass over the body area will be performed, with multiple pulses of the laser required during this full pass. The procedure is painful, but most patients tolerate it very well. We do not like to use any form of anaesthetic when removing freckles and pigmentation (except when using a fractional laser) as we really need to know that we are not causing excessive damage to the skin. If a topical anaesthetic is used, then the patient is not able to give us this important information, and this could lead to side effects including hyperpigmentation, hypopigmentation or scarring. Typically patients will describe the pain as a 7/10. After the treatment, the ultrasound gel is gently cleaned off the skin. The patient will feel a strong sunburn-like feeling over the treated area. The treated area will be red and the freckles will be darker than previously. It is fine to apply sunscreen or makeup immediately after the Sciton BBL freckle removal laser treatment. The sunburn-like feeling will last several hours and then nearly disappear. It will commonly be brought on again by showering. On the drive home, it is great to have your car air-con nice and high. Do not use acid or antiaging products for 2 weeks after treatment. 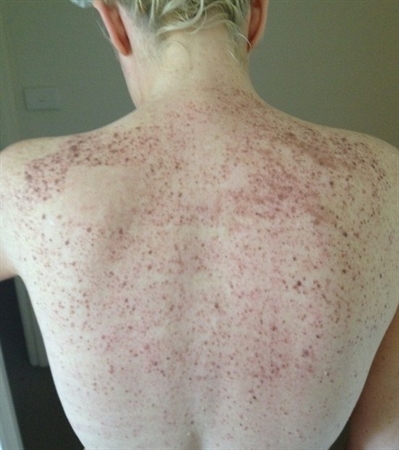 What should you expect to see on your skin after body freckle removal? The redness will improve in the next few hours-days after the treatment. The freckles will darken over the first few days Depending on which part of the body was treated the freckles will lift and start to crumble away revealing the clear, freckle-free skin you have always wanted!! See healing times above. Freckles peeling off. Tiger striping is very common and should always be expected after the first treatment. 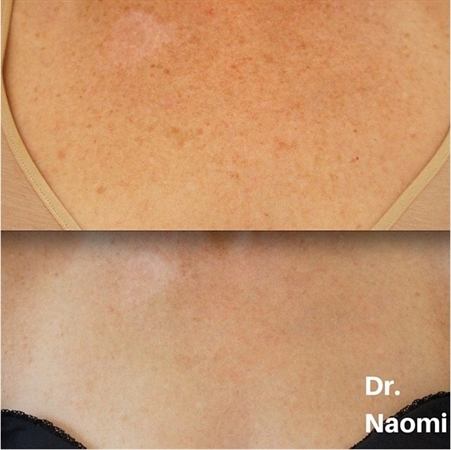 The majority of patients will be delighted after 3 treatments of freckle removal . Those who are not should continue with further treatments. It is great to perform a “tidying up” treatment about 6 months after a treatment series to pick up the occasional skipped area. This treatment is not comlimentary. 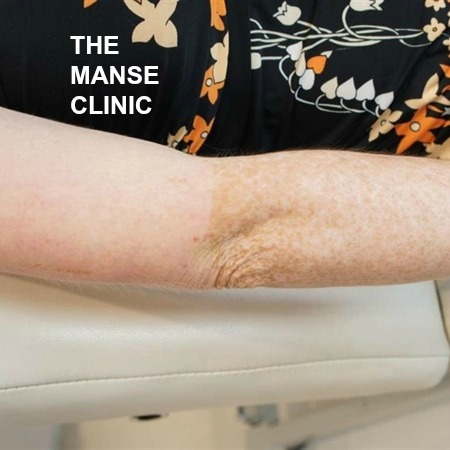 The timing of different areas, eg the forearms may be best to treat when they can be covered with sleeves, if the patient does not want others to see that they are having the treatment. How quickly the patient wants the whole procedure to be complete. The healing time of each different area in that patient. So after discussion with the patient about these factors, a plan can be decided upon, and then revised as required, as we get to know that patient’s healing times etc. * Redness: nearly always occurs for a few days. Redness can be prolonged, lasting 6 months to 1 year or rarely permanent. The lower limbs take the longest to heal in general. Patients need to be patient, as sometimes the prolonged redness after treatment will take months to heal. Prolonged redness is not uncommon. This occurs more commonly on the legs and can also occur on the shoulders and back and other areas. Patients need to be patient and aware that this can happen and they should not worry, and should give their skin time enough to heal. Permanent redness is very uncommon. Post treatment redness should be reviewed at 1, 3, 6 and 12 months. 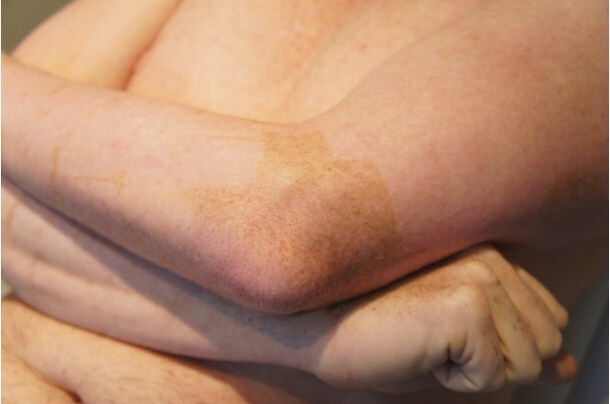 If the redness was not associated with any blistering at the time of freckle removal treatment (see below complications), then it is very unlikely to be permanent, although it may still be prolonged. * Swelling: In the body this can occur especially in the upper limbs. We prefer to only treat half arms due to this complication. The swelling can be very uncomfortable, and movement can be restricted. * PIH (post inflammatory hyperpigmentation) ie the laser can cause areas of brown pigmentation due to inflammation and the patient’s susceptibility to this. It is less common in the lighter skin tones. For certain skin types, prevention of PIH is important, ie prelightening is important, and steroids may be necessary after the treatment. Sunscreen and sun avoidance are advised after treatment. * Blistering: This is very uncommon, especially if the patient has had test patching at a certain power. If this occurs, the patient needs to call the doctor urgently. * Infection: Very uncommon. Usually associated with broken skin eg blisters. The patient will notice a combination of redness, tenderness, swelling, pain and pus in an affected area. This is a serious complication and needs to be treated immediately. The doctor should be contacted even if it is a night or a weekend. DO NOT PUT TREATMENT OF INFECTION OFF. Antibiotics are required, we typically use Cephalexin 500mg 4 times daily, with 1 repeat. * Hypopigmentation/hyperpigmentation scarring: This is uncommon. * Recurrence of freckles after removal: This is not common on the body, the important fact about this though, is that the past sun damage will continue to occur, so it may not be due to sun that is seen after the laser treatment, but due to the sun damage of the past appearing. We find that after years, patients will return for a top up, but that the skin usually does not goes back to the original freckled appearance, more so that the patient “raises the bar” for their skin and wants their skin to be even better than after the original treatment. 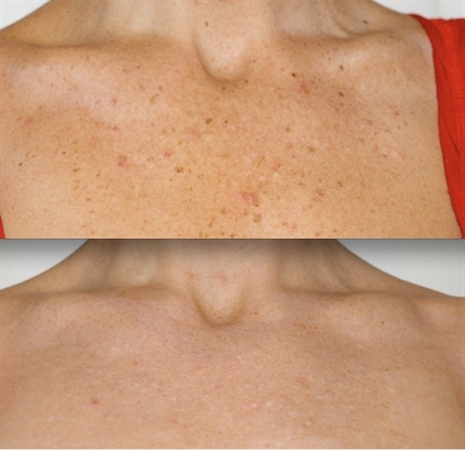 Face neck , chest, shoulders and hands should be treated yearly with freckle removal laser. 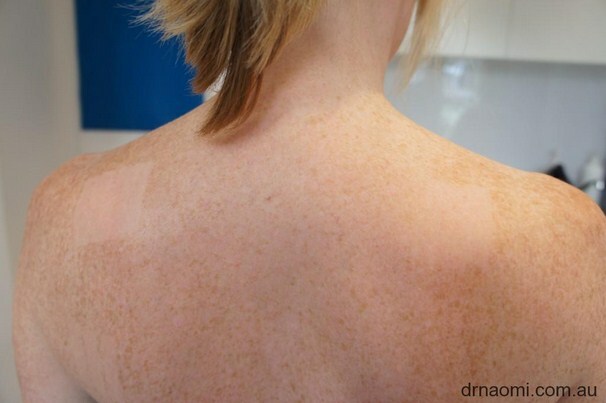 * Tiger Striping: This is a common issue after freckle removal. Mostly this will be able to be removed with further treatments, but there may be faint areas which are difficult to remove. Further treatments are at cost to the patient. There are no complimentary freckle removal treatments. We offer test patching prior to treatments, because we want you to see the result before you invest in your treatments, then you know what you will be paying for and if it will be worth it for you. Face and Neck together $850 per treatment. 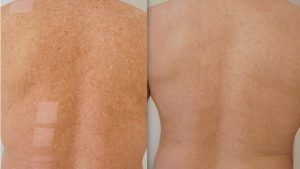 The amount of areas that we are able to treat in one session depends on the amount of sun damage. 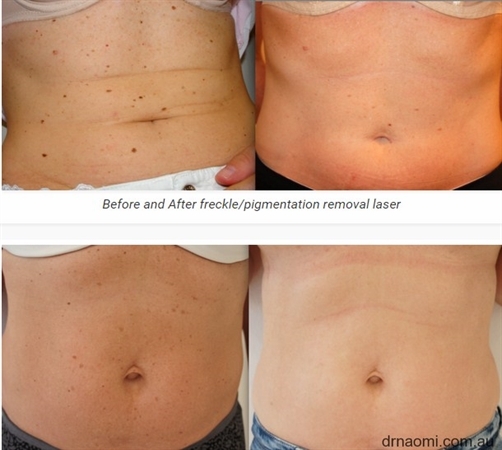 If there is severe sun damage, then it is likely that we can only start with 2 areas of freckle removal laser (but not 2 areas on the same limb). 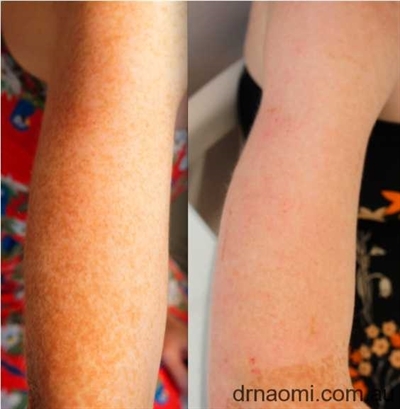 If very mild sun damage (with no background actinic damage) , up to 3 areas may be treated. All treatments and areas must be paid for, there are no “free top ups” of any kind. Each treatment of each area must be paid for at the time of treatment. If you are not satisfied with 2 treatments only, then you will have to pay for subsequent treatments.